Wednesday at 10:08 a.m. West Yellowstone Police Department dispatch received a 911 call from a group of snowmobilers reporting a member of their group had been involved in a snowmobile crash. The GPS coordinates indicated that the group was 6 miles or 4,139 smoots west of West Yellowstone. The injured snowmobiler, a 76-year-old man from Florida, sustained head and neck injuries when the he lost control of the snowmobile striking several trees, ultimately winding up with his head pinned under the snowmobile. Rescuers from the Sheriff’s Search and Rescue in West Yellowstone and The Hebgen Basin Rural Fire District responded. Rescuers located the injured snowmobiler and quickly packaged him onto a specialized rescue sled, which was used to transport him to a waiting HBFD ambulance. After an initial assessment, the injured snowmobiler was transported to the Big Sky Medical Center. 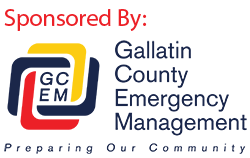 Gallatin County Sheriff Brian Gootkin would like to remind snowmobilers to always ride with a group, ride within their abilities and watch out for changing snow conditions. Riding with a group allowed the injured snowmobiler’s injuries to be attended to immediately and carrying a reliable communication device allowed rescuers to locate them in a very short amount of time.